AVENTURA, FL--(Marketwired - Jul 11, 2016) - Hosting the perfect summer event in South Florida just got better with two affordable outdoor packages recently announced by the Courtyard Miami Aventura Mall hotel. Whether planning a casual corporate business event or celebrating a special social occasion, the Courtyard Grill of this Aventura hotel, adjacent to North Miami Beach, offers venue space and services that will help you organize a unique and unforgettable event. The poolside courtyard lounge with pleasing gardens and island barbecue grill and bar areas, creates a versatile outdoor setting that can be dressed up or kept casual for welcome receptions, mixers and socials, or "Meet and Greet" occasions. Talented grill masters can enjoy showcasing their unique outdoor cooking skills and popular outdoor recipes with colleagues, friends and family, or bring along a their own private chef for a personalized menu that will have guests raving for days following the event. Our flexible venue space will make planning an outdoor celebration for your company employees, birthdays, anniversaries, or wedding events in North Miami Beach accessible at one of the area's best budget-friendly poolside courtyard packages. The low rates for use of this stylish courtyard setting are a great start to creating a fun and successful outdoor event. Whether formal or casual, booking a refreshing South Florida event with these outdoor hosting deals can easily be done by contacting the friendly Courtyard Miami Aventura Mall event sales staff at 305-937-0805, ext 7605. The hotel's stylish accommodations and ample meeting spaces also make it an ideal destination for all types of group travel. *Rates do not include food and are subject to change depending on the time of booking and availability. With newly renovated interiors, tech-friendly features and award-winning service, the Courtyard Miami Aventura Mall matches the city's cosmopolitan feel and welcomes guests to enjoy a change of pace whether traveling for business or leisure. The hotel's 166 rooms, including double and king rooms and king suite options, are outfitted with Marriott luxury bedding, free Wi-Fi, state-of-the-art fitness center, 24-hour business center, and fresh coffee service to provide travelers with everything needed for savvy traveling. Two meeting rooms measuring 648 sq. ft. each, totaling 1,296 sq. ft. of interior meeting space, and an exterior courtyard measuring 640 sq. ft.
Each meeting room is accompanied by state-of-the-art technology and tasty event menus are also available to facilitate successful gatherings for up to 55 guests, as well as an exterior Courtyard 150 guests. Other amenities include on-site dining at The Bistro, proudly brewing Starbucks coffee, where seasonal breakfast, lunch, and dinner, options are available daily, as well as a full bar offering 2-for-1 drink specials. Courtyard Miami Aventura Mall hotel amenities and exceptional hospitality offers the perfect travel spot to help you make room for a little fun. 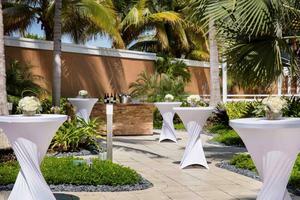 Courtyard Miami Aventura Mall makes hosting summer events a breeze with outdoor package deals.